Since I don’t like eggs, cheese, or tofu, vegetarian food in my house typically involves beans in some form or fashion. I haven’t been very creative with them. I can only have lentil soup or chili or chickpeas and sweet potatoes so often, even though I love them. So, you can imagine that I’m excited to have a new recipe featuring beans to share, even if it isn’t vegetarian. This Stewed Chicken and Chickpeas is fantastic – an easy, mostly hands-off, one-pot meal! 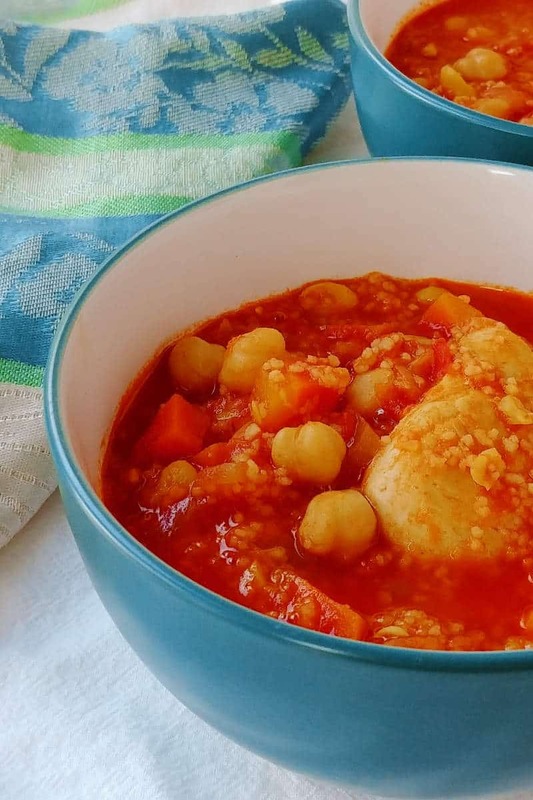 This recipe was inspired by Stewed Chickpeas with Chicken from Mark Bittman’s How to Cook Everything (affiliate link), which I rifled through a lot while I continued meal planning after I did the Cook90 challenge in January. His recipe sounded delicious, but was going to involve three different dishes and using both the stove and the oven. I stay at home with a 3-year-old and try to work on this food blog on the side. I don’t have time or energy to make that much of a mess, or clean it up, just for dinner one night. That is to say, I don’t know how the original is because I decided to streamline it, and it turned out so well that I’ll never make it any other way. The chicken and chickpeas are spiced but not spicy, making this dish good for the heat-averse. I know I’m writing about this in July, but it’s a cozy, warming meal that I’m going to enjoy this fall. It makes great leftovers. Chickpeas, also known as garbanzo beans, are the delicious key ingredient in hummus. They have a dense texture and so will remain firm after being stewed. 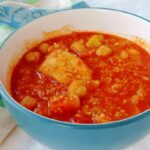 I prefer crushed tomatoes or tomato puree over tomato sauce in this recipe, mainly because every tomato sauce I find in the store has spices already added. Diced tomatoes made the stew a little too thin for me, but can be used in a pinch. 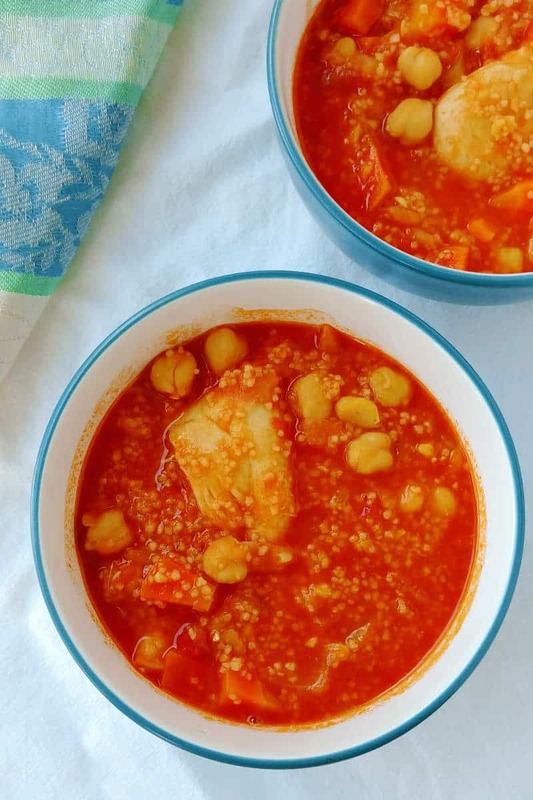 This recipe has Spanish or North African flavors. You’ll notice this dish has spices – cumin and coriander – but nothing spicy. If you wanted it to have some heat, though, you could add some red pepper. Watch your cooking temperature – be careful not to have the heat too high, or you will boil the chicken and it will be a little tough. You need a low simmer. I usually find I can break the chicken apart with a spoon once the stew is done. The chicken and chickpeas were rather stewy on their own, so I added some couscous to the meal to bulk it up. Couscous is tiny, but is actually a pasta and not a grain. Often couscous comes in little boxes with seasoning packets (which you do not need here). I love using couscous as a side for a lot of meals because it is ready in just 5 minutes. It’s added to the pot at the end of this recipe, and will absorb the hot liquid of the stew, but must rest for 5 minutes to do that. There’s no need to have the heat on during this time. If you can’t find couscous, you can serve the stew over any cooked grain. 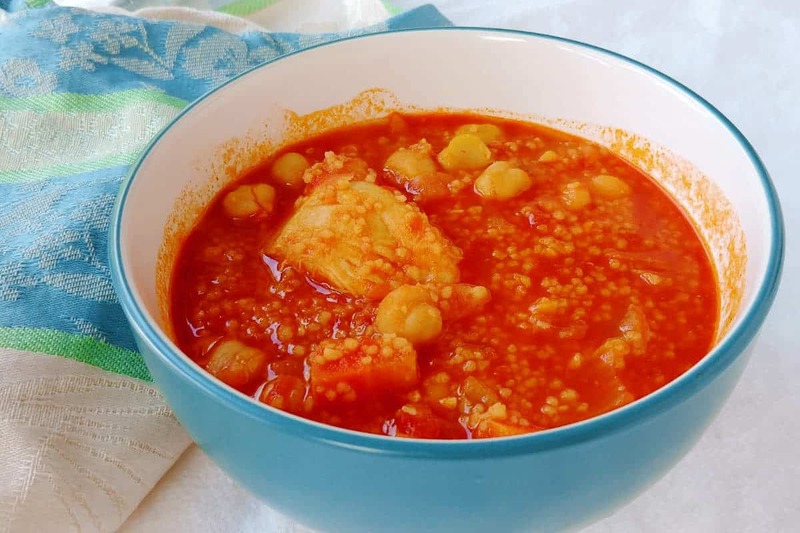 Or, you can add the 1 1/3 water with the tomato sauce and chickpeas, and add orzo, or another small pasta, instead during the last 5-10 minutes of cooking. Keep the heat on. Cook it for however long the box of pasta says is necessary; you may need additional water or cooking time. Leftovers with pasta will likely become very thick as the pasta will continue to soak up liquid. Can I Make This Vegetarian? I haven’t tried this as a vegetarian meal, but substitute 2 more cans of drained chickpeas in for the chicken. You could also try sauteing vegetables, such as eggplant, in place of the chicken; cook for 10-15 minutes after adding the chickpeas, instead of 30 minutes. Have questions or like this recipe? Leave a comment or rate the recipe below! Stewed Chicken and Chickpeas is an easy and healthy, one-pot meal. Mostly hands-off, it's perfect for weeknight dinners! Heat oil in a large pot over medium to medium high heat. Add chicken breasts. Spread onion, celery, and carrots around it. Brown the chicken for 5 minutes, stirring the vegetables occasionally. Flip the chicken breasts and sear for another 5 minutes, stirring the vegetables once or twice. Add garlic and ginger and cook for 1 minute. Stir in cumin and coriander. Add broth and scrape the browned bits from the bottom. Add tomato sauce and chickpeas. Bring to a boil, then reduce heat to a low simmer. Cook uncovered for 30 minutes, stirring occasionally. Add water and bring to a bubble. Stir in couscous and turn off the heat. Let rest for 5 minutes before serving. Make it vegetarian by sauteing 3 cups diced eggplant or other vegetables instead of chicken. Simmer with chickpeas for 10-15 minutes instead of 30. If you can't find couscous, you can serve the stew over any cooked grain. Or, you can add the 1 1/3 water with the tomato sauce and chickpeas, and add orzo, or another small pasta, instead during the last 5-10 minutes of cooking. Keep the heat on. Cook it for however long the box of pasta says is necessary; you may need additional water or cooking time. Leftovers with pasta will likely become very thick as the pasta will continue to soak up liquid.